Following our initial survey and quotation, we were appointed by the client to rectify an ongoing problem that they were experiencing with the existing weather proofing on their balcony roof. The client was also installing new patio doors leading out from the master bedroom to the balcony and needed to ensure a watertight seal on the door threshold. We have been installing Sarnafil, the Swiss manufactured single=ply membrane, since 1982 so have extensive experience and knowledge of this product. After discussion with the client, it was agreed that the best option would be to overlay the existing felt weatherproofing with Sarnafil G410 15ELF membrane which was bonded with Sarnacol 2142 to the existing substrate. 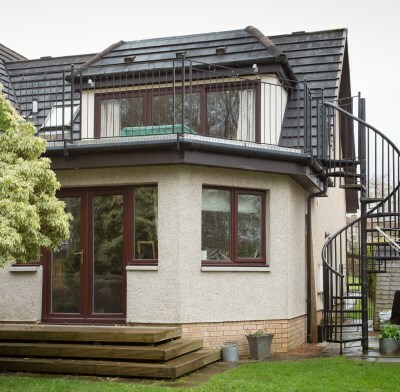 We were appointed by W M Beaton & Sons Ltd to work with them at Kierhead Cottage. 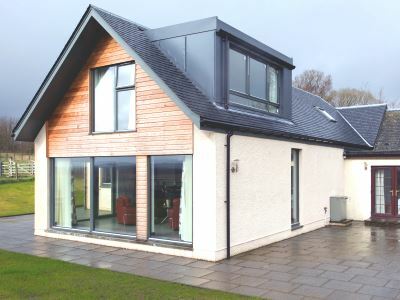 The property was being extended with a singlestorey extension and two dormer roofs being constructed. We installed Sarnafil G410 12ELF membrane to the extension and dormer roofs and encapsulated the dormer fascias and haffits with Sarnafil S327 12EL membrane, which was side lap fixed. We also installed Sarnafil Décor Profile to provide an aesthetically pleasing finish. This creates an appearance of traditional standing-seam metal roof and can be applied to any exposed Sarnafil PVC roof system. It is extruded and produced with the same high quality compounds as used for Sarnafil waterproofing membrane. 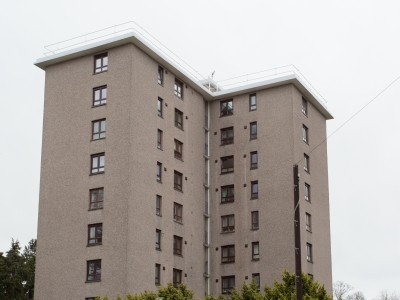 McGill Electrical Ltd was appointed by Abertay Housing Association to carry out an extensive refurbishment project to improve its properties at Dryburgh Gardens, Dundee. There are four high rise blocks, with 81 properties owned by Abertay Housing Association and 39 privately owned. Aim Developments Ltd was appointed by McGill Electrical Ltd to remove the existing roof coverings to the concrete deck and to supply and install the specified Sarnafil waterproofing system. This project received substantial funding from the Green Deal, the government’s flagship energy policy designed to give property owners the opportunity to pay for energy-saving improvements through savings made in energy bills over time. awarded the contract by the main contractor, J Smart & Co. 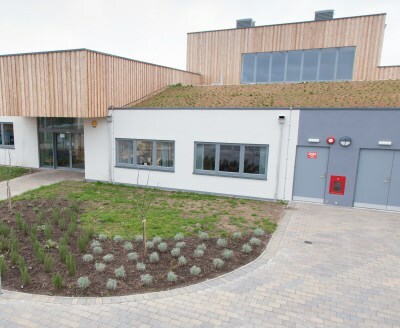 This was a new build school being constructed to replace the existing Invergowrie Primary School. Aim Developments Ltd was successful in winning the tender bid and we were contracted by Morrison Construction on behalf of Perth and Kinross Council in January 2013. We have worked on various projects with Morrison Construction and for Perth and Kinross Council and have a good working relationship with both. As this was a new build project it was a fast track construction, so timescales were critical for each task. This meant we had to work closely with Morrison Construction to ensure that the contract was successfully completed on time, so meeting the contractor and clients schedule. Aim Developments Ltd was employed by Fife Council to carry out the refurbishment of the swimming pool roof at Lochgelly High School. 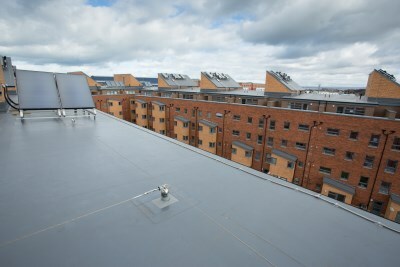 This project was carried out as a Sarnafil Roof Management project. Sarnafil, the world’s leading single-ply manufacturer, developed Roof Management (now referred to as Sarnafil Plus) to relieve the pressure on owners or managers of buildings, who are often responsible for thousands of square metres of building area. We have worked with a variety of clients in the utilities sector including BT, Scottish Water and Scottish and Southern Energy, and on a huge range of sites and projects. We take pride in offering a high level of service to our clients regardless of how many miles away or feet above water a site may be. And our employees thrive on the varying projects offered to us from this sector and some of the idyllic - but sometimes high risk - surroundings they get to work in.